On, off and now on again, the Paris production of Leonard Bernstein’s Candide that was shown on BBC4 over the New Year, was dropped by La Scala, its next staging post, over artistic differences – apparently to do with the sight of singers in Bush, Putin, Blair, Chirac and Berlusconi masks prancing around in flag-themed underpants. The former Italian PM gets an attack of hypertension when he sees an unkind caricature and La Scala can ill afford to offend his many powerful friends. There, however, comparison ends. Gubaidulina moved after the Soviet era That put English National Opera in a pickle since ENO has a share in the Euro 500,000-plus co-production and is due to bring the show to London some time. Happily, before matters got out of hand, Candide’s Canadian director, Robert Carsen, traced the La Scala boss Stephane Lissner to his holiday hideaway on Haiti and set up a meeting for next Monday to iron out his misgivings. So the show is back on again and ENO is heaving a sigh of relief at a crisis averted. But those who watched the BBC relay must be wondering if it is worth importing. Candide is a static sequence of cabaret songs that works best in concert. A 20th century send-up of the Voltairean idyll, it was written during the McCarthyite fear of 1954, a year when the composer had his passport confiscated by the US State Department and was domestically unemployable. Glitter and be Gay, the most dazzling of Bernstein’s torch songs, is meant to be sung straight and through gritted teeth. Carsen, in his version, camped up the heroine as Marilyn Monroe and milked every laugh til it croaked. Candide’s home castle was modelled on the White House and Westphalia was renamed West-Failure, geddit? Despite much leaping about and 400 costumes, we witnessed a sequence of narrated set-pieces, more singspiel than opera. A nervous ENO has yet to fix a date for Candide. It would do best to cut its losses on the staging and book the Barbican for a run of concert performances. 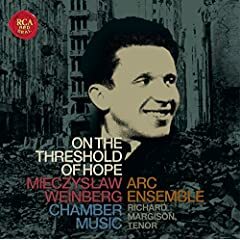 Mieczyslaw (Moishe) Weinberg (1919-1996) was the composer closest to Shostakovich, each playing the other his new works before committing them to print. When Weinberg was arrested in the last weeks of Stalin’s terror, Shostakovich wrote to the NKVD chief Beria protesting his innocence. Weinberg, a prolific symphonist, is at his most expressive in chamber works that he imbued with echoes of contemporary Jewish suffering. His 1945 clarinet sonata played here by Joaquin Valdepenas and Dianne Werner, is a miniature masterpiece, combining a klezmer-like improvisatory spirit within a strict formal structure. The 1944 piano quintet bears kinship to a prior work in the same form by Shostakovich. Both are melodic, ironic and disrupted by passages of panicky agitation; Weinberg, however, finds a soft ending. These revealing performances, by members of the Royal Conservatory of Music, are testimony to a Soviet composer’s courage, ingenuity and, in the clarinet sonata, near-genius.